The planned destination for the 1587 colony was the Chesapeake Bay, but ship captains dropped them off at Roanoke Island. 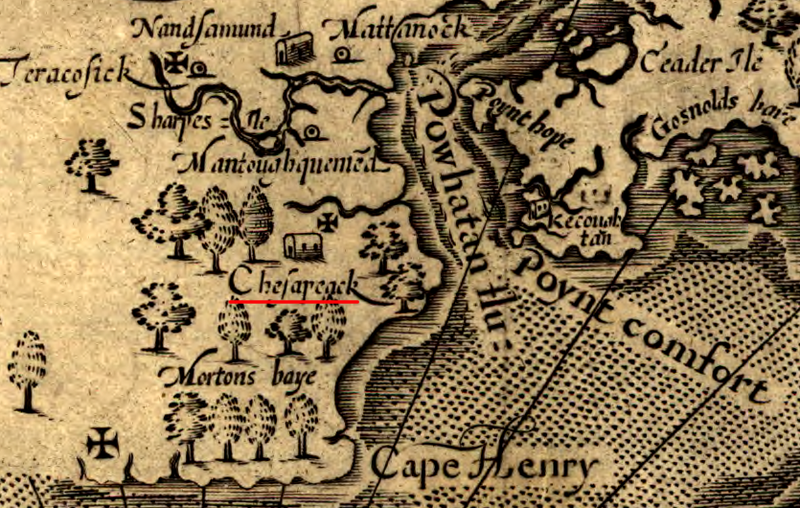 Survivors of that colony may have moved north to the territory controlled by the Chesapeakes, near the Lynnhaven/Elizabeth rivers. However, Powhatan expanded his territory and eliminated the entire Chesapeake community about the time Jamestown was settled. 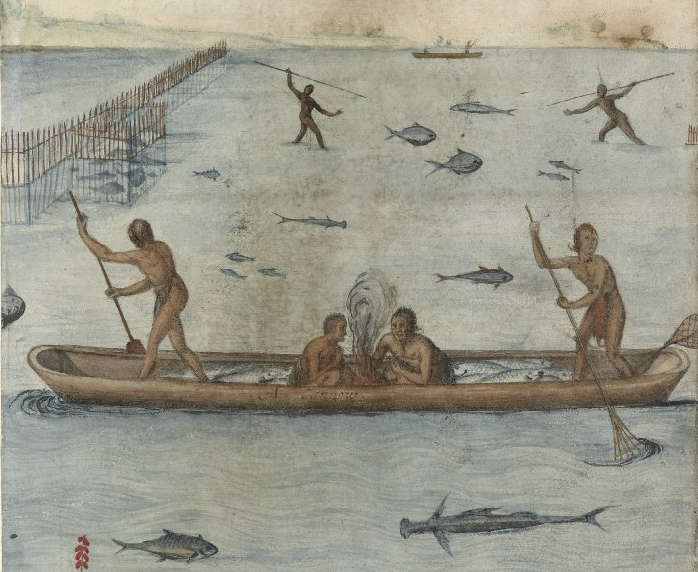 "we found, and in divers places that aboundance of fish, lying so thicke with their heads above the water, as for want of nets (our barge driving amongst them) we attempted to catch them with a frying pan: but we found it a bad instrument to catch fish with: neither better fish, more plenty, nor more variety for smal fish, had any of us ever seene in any place so swimming in the water, but they are not to be caught with frying pans..."
For Native American societies that hunted and gathered food after the harvest in the Fall, access to the bay was important. It is not surprising that on his 1608 voyage up the bay and some major tributaries, John Smith saw Native American towns surrounded by palisades of tree trunks. The competition between tribes was not always peaceful; the protein resources of the bay were worth a fight. Despite having a river filled with seafood at the edge of their fort, the freshly-arrived English managed to starve to death in Jamestown. Later colonial Virginians made far better use of the protein in the bay. 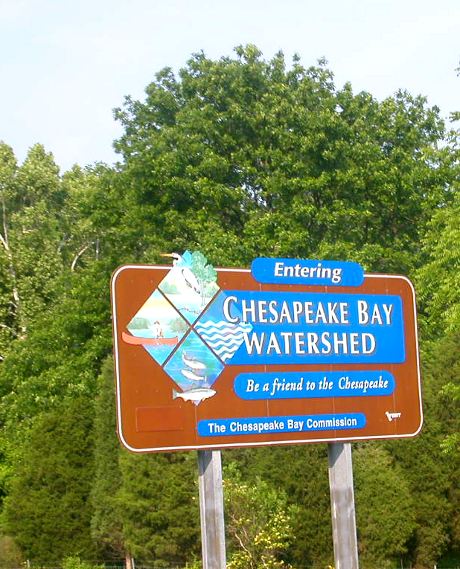 The Chesapeake Bay, one of the largest estuaries in the world, is a rich protein resource of oysters, clams, crabs, and fish in part because of the mixture of salt water from the ocean and fresh water from various rivers. The salinity of the open Atlantic Ocean is 35 parts per thousand (ppt). 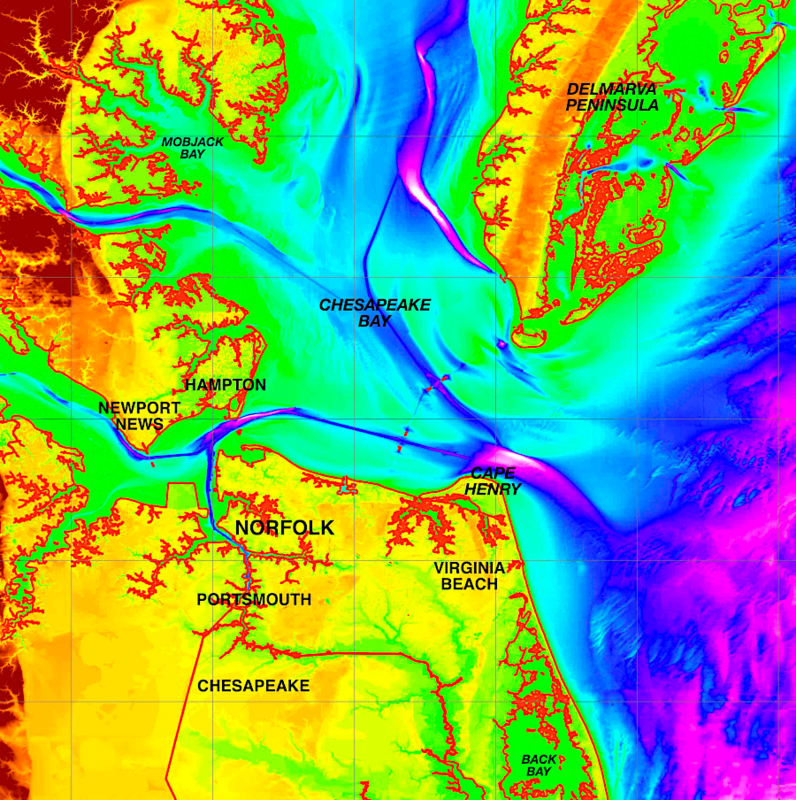 In the Chesapeake Bay, fresh water flowing off the land dilutes the salt water entering from the ocean, creating a brackish estuary. 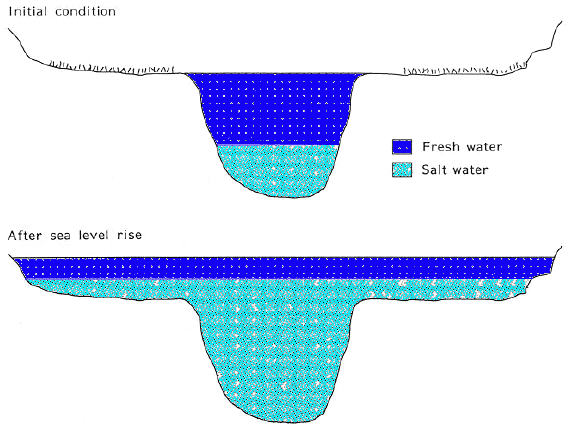 Salinity is the key difference between a fresh water lake/river, an estuary, and the ocean. In an "estuary," fresh and salt water mingle together to create a special environment that is highly productive biologically. Marine fish, species who can live in brackish water (with salinity between 0.5-35 parts per thousand) and freshwater species both take advantage of the estuary. In addition, numerous plant and animal species have specialized over the centuries to thrive in the brackish water. Decaying marsh grasses provide the organic material at the base of the detritus food pyramid. Big fish at the top of the food chain eat little fish. Lower down on the food chain, little fish eat invertebrates, and invertebrates eat detritus - the decomposing plant material with microorganisms consuming the vegetation, at the bottom of the food chain. The vast amount of life in the bay was triggered in part by that large amount of ecological "edge" where the land meets the sea, plus the ability of sunlight to reach the bottom across much of the shallow bay. 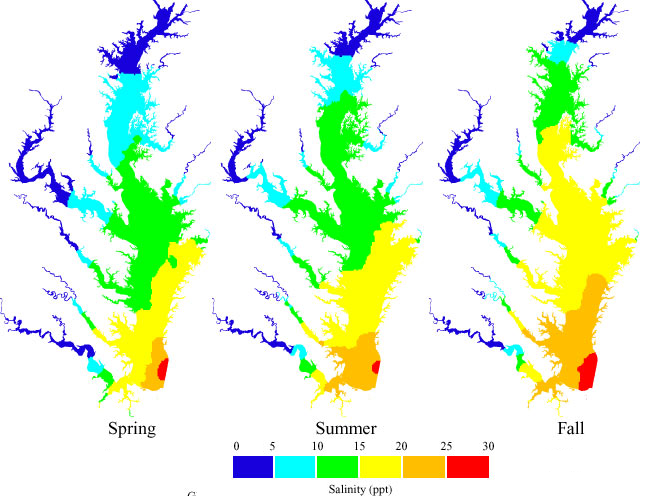 The depths at which Submerged Aquatic Vegetation will grow in the tidal waters of Virginia and Maryland is limited by wave action in the shallow end (the roots can't hold the plants in one place, if the water is sloshing around with too much energy) and by light penetration in the deep end (the deeper the water, the less light at the bottom). Submerged aquatic vegetation provided food and shelter for microscopic zooplankton, blue crabs, and other wildlife while oysters grew in such quantity that their old shells piled up into bars that obstructed navigation. 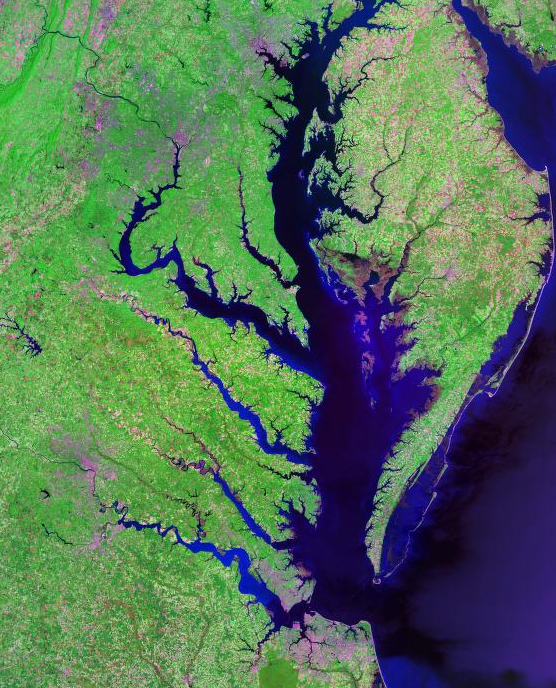 The Chesapeake Bay is a recent feature in the Virginia landscape. When the glaciers started to melt faster than they grew at the end of the last ice age 18,000 years ago, the volume of liquid water on earth increased significantly. Rising sea levels flooded first the continental shelf, and then the river valleys of the Susquehanna and James rivers. 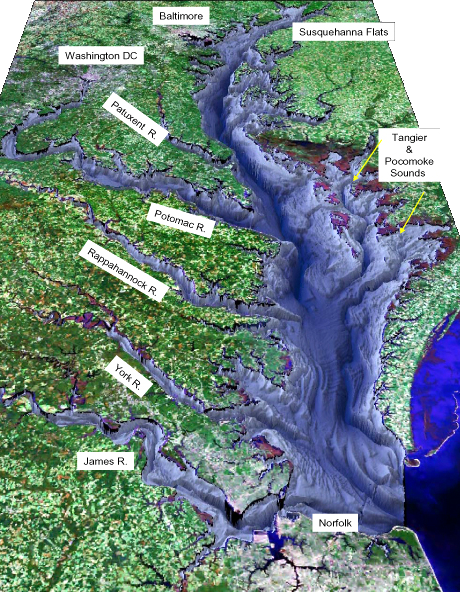 As the last ice sheet retreated, ocean currents brought sediments from the Delaware River south, extending the length of the Eastern Shore and blocking the direct path of the Susquehanna River. Native Americans have been in Virginia for 15,000 or so years. 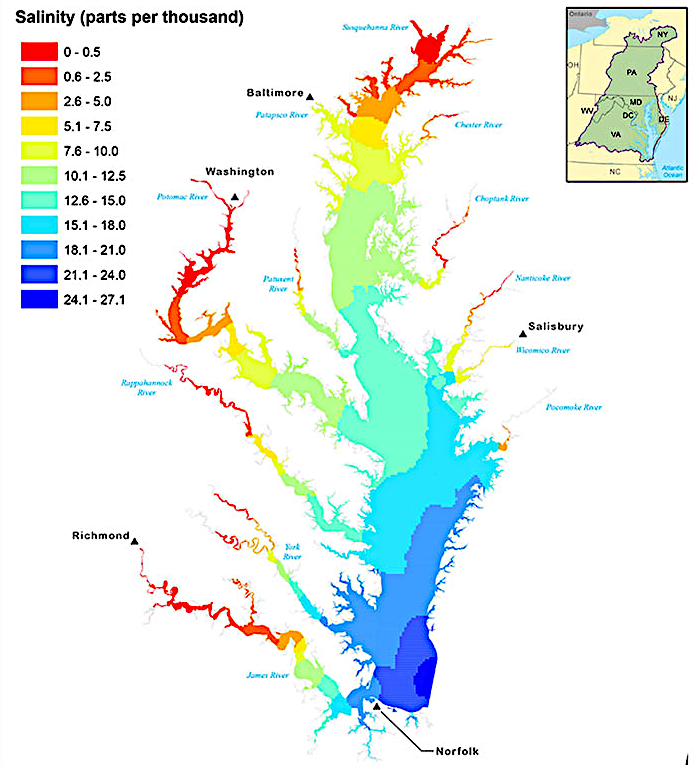 That means humans saw the Virginia shoreline change dramatically as the rising seas first flooded the continental shelf, then flooded the channel of the Susquehanna River to form the Chesapeake Bay. 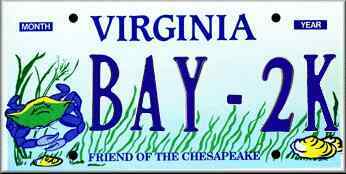 The first Virginia immigrants had to move up the hillsides as the landscape evolved and the Chesapeake Bay developed. Modern scorecards to measure the bay's health have to use a baseline to define "healthy." Many references to "Save the Bay" initiatives are based on the assumption that the bay was healthy in 1600, so that is an appropriate base line for assessing restoration to the historic condition. The biological conditions of the bay have changed far more than the geological setting in the last four centuries. The stocks of seafood could recover easily from the minor impacts of Native American/early colonial harvests, but the impacts of modern fishing, clamming, oystering, and crab harvests in the last century have reduced populations dramatically. New species have been introduced, and the balance between species has been altered. The physical conditions of the sediments and water in the bay have been changed forever, and 17 million people living in the watershed continue to contribute various forms of pollution every day. Though restoration efforts for oysters and other species are underway, the bay will never return to its original condition. 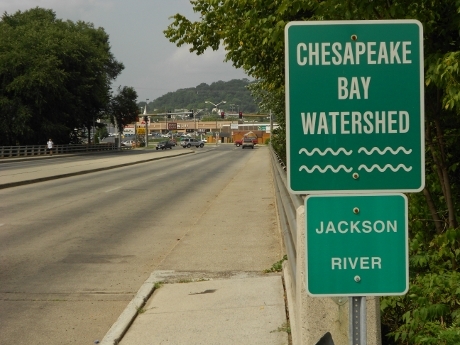 The states and District of Columbia failed to reduce pollution sufficiently to meet the minimum standards of the Clean Water Act, despite 25 years of synchronized promises dating back to the 1983 Chesapeake Bay Agreement (which was signed on the George Mason University Fairfax campus). That led to mandatory requirements, imposed by a Federal judge and negotiated with the states by the Environmental Protection Agency under President Obama. 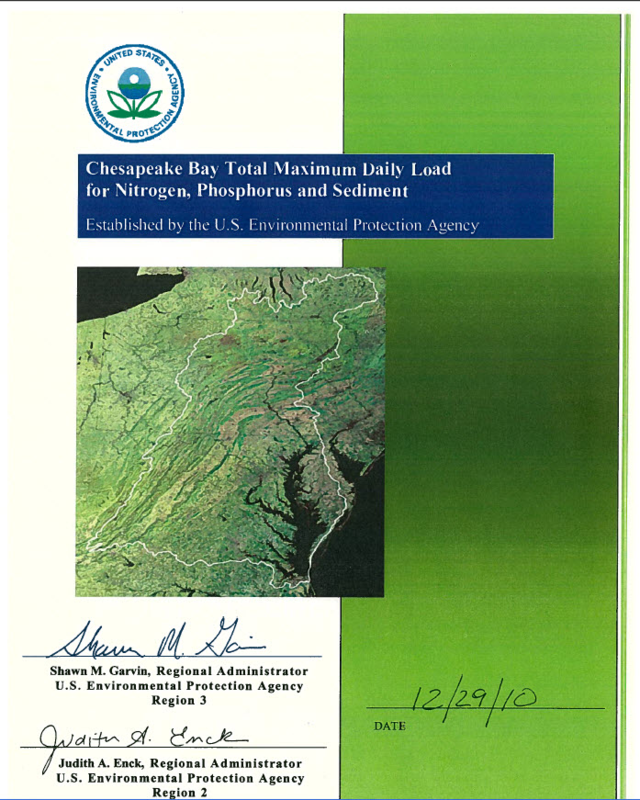 In May 2009, President Obama issued the Chesapeake Bay Protection and Restoration Executive Order defining a leadership role for the Federal government. In 2010, a Federal court ordered the Environmental Protection Agency to complete a Total Maximum Daily Load (TMDL) study and establish pollution limits. 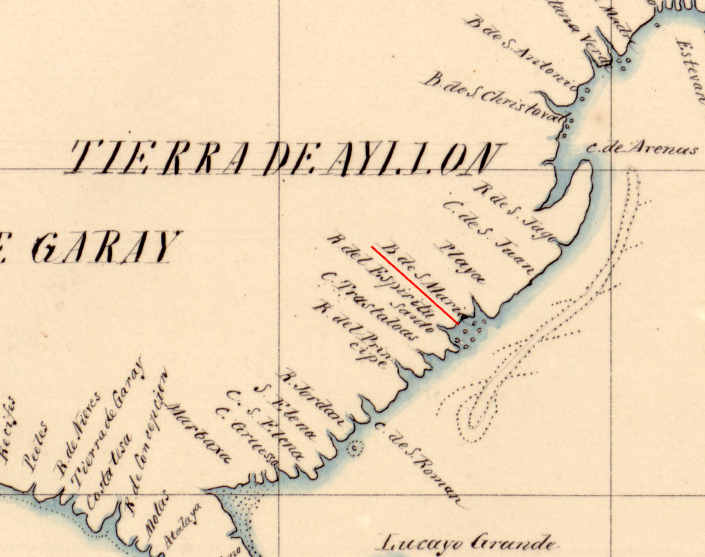 Where is "Tidewater" in Virginia? How big is the Bay?